Need to remove paint? These stripping tools will prove useful. Stripping off old paint isn’t really much fun. It’s usually a messy job: Whatever method you use (dry scraping, heat, or chemical strippers), the residue of old paint seems somehow to spread itself all over the workshop. With the proper tools, however, removing old paint can be done efficiently. The Heat Gun. Heat guns typically have the shape of a gun, with a pistol handle and a switch controlled by your trigger finger. 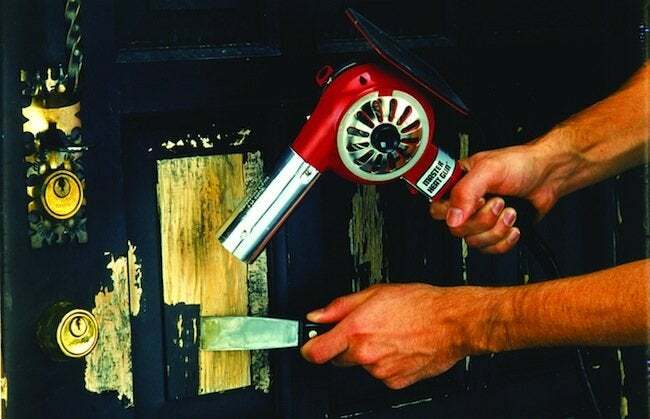 The gun is used to remove paint (in tandem with a paint scraper), but also will loosen old window putty and tile, as well as soften certain plastics for bending or shaping. Heating capacity varies from one gun to another. Some have as few as six or seven hundred watts; others have as many as fourteen hundred watts. Some top-of-the-market models have an electronic control mechanism that senses when the gun is running too hot (it detects back pressure) and automatically maintains a constant temperature. The temperatures on most guns are adjustable; the range may range from 250 degrees to 1,100 degrees. Hold the gun three to six inches from the surface to be stripped. Keep it moving over a small area, back and forth or in a circular mo­tion. When the paint blisters, remove the gun from the area and im­mediately scrape the softened paint. Often a second pass is required. The Heat Plate. A near relation of the heat gun, the heat plate consists of a heating element in the shape of a loop. A metal reflector helps di­rect the heat to the workpiece, maintains the tool at a fixed distance from the surface to be stripped, and protects you from the red-hot ele­ment. Some heat plates have built-in scrapers at the toe, others a built-in stand that the tool can rest on while cooling off. When in use, the tool is held by its insulated handle. The heat plate is best suited to stripping flat surfaces such as doors and panels. As with the heat gun, the heat plate requires a little experi­mentation. Depending upon how much paint has accumulated on the surface, the plate may need to remain in a given spot for relatively longer or shorter periods of time. When the paint begins to bubble, scrape it with a paint scraper. There are other stripping options, too. Many chemical strippers are on the market. When using them, be sure to provide plenty of protec­tion, both for yourself and the surfaces nearby. Gloves, safety glasses, and a respirator mask are a good idea; so is having plenty of newspa­pers handy. And another thing: If you are stripping paint of a certain age, test it for lead content; most drugstores sell inexpensive testing kits. If there is lead-based paint on the elements to be stripped, be sure to wear a mask when you are scraping. Isolate the job so the entire house doesn’t get contaminated. Frequent hand washings are essential, too, as is changing out of your stripping clothes when you reenter the in­habited part of the house. If children live in or visit your home, you would be wise to do the job someplace else altogether as lead is a great danger to them. And very little lead can do a great deal of harm. The belt sander will also remove paint, both from metal and wood. Be aware, however, that this robust machine will, if you are not watch­ful, gladly remove more than the surface of paint or varnish. It’s a rough and ready tool for tough jobs, not one suited to delicate duty.